Good Morning, Glad that I found this site, I would like to practice Reiki , and learn more about it …can some one suggest where to begin with this, and of course I will probally pick up the book evreything Reiki…for some time now i have been trying to find something that speaks to me. Lots of people seem to be involved with this, but is all Reiki created equal…??? thanks for your help. Not sure if you have found your answers yet but I recently began my quest to becoming a certified Reiki Master and am taking Reiki Level II in about 2 weeks. Search locally for someone who certifies in the field of Reiki and make sure you have a session with them first…you want to connect. Also, I have found that there are several styles of Reiki practitioners, however there is one source and we all work from there. Trust your intuition and let it guide you. Sound like good book. I will look into it after I read the ebooks on reiki I down loaded. 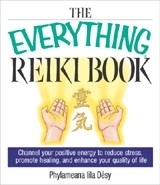 The book stresses reiki can be for almost everyone.